Arithmetic Pipelines are mostly used in high-speed computers. They are used to implement floating-point operations, multiplication of fixed-point numbers, and similar computations encountered in scientific problems. To understand the concepts of arithmetic pipeline in a more convenient way, let us consider an example of a pipeline unit for floating-point addition and subtraction. Where A and B are two fractions that represent the mantissa and a and b are the exponents. Compare the exponents by subtraction. Add or subtract the mantissas. We will discuss each suboperation in a more detailed manner later in this section. The following block diagram represents the suboperations performed in each segment of the pipeline. Note: Registers are placed after each suboperation to store the intermediate results. The exponents are compared by subtracting them to determine their difference. The larger exponent is chosen as the exponent of the result. 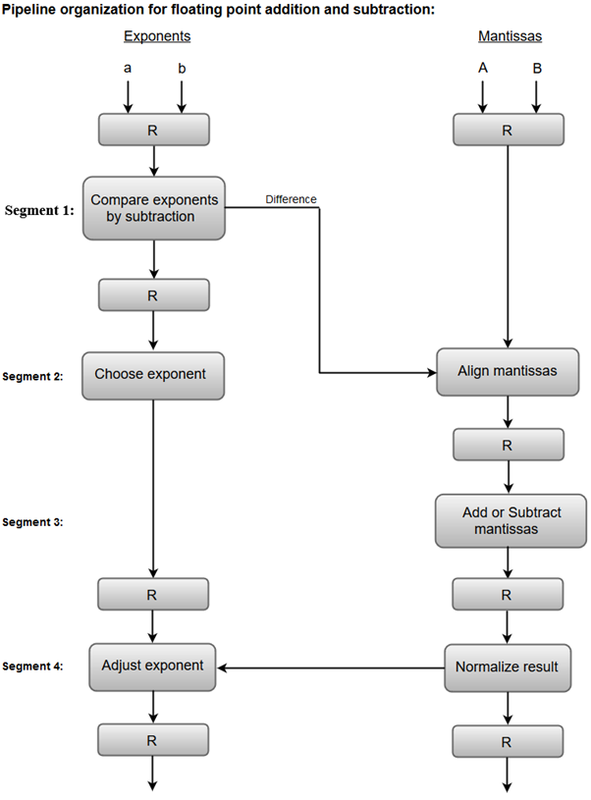 The difference of the exponents, i.e., 3 - 2 = 1 determines how many times the mantissa associated with the smaller exponent must be shifted to the right. The mantissa associated with the smaller exponent is shifted according to the difference of exponents determined in segment one. The two mantissas are added in segment three.